My own personal view is that the Northern Ireland Conflict or Northern Ireland Troubles is yet to finish. I believe there is still much to write about the History of Northern Ireland as it is a land that was born in conflict, has lived in conflict and to this very day is still in a state of conflicting views. Yes the Northern Ireland Assembly is up and running but it is an establishment that could simply come crumbling down at any moment. The old saying about a house being built on shaky foundations is so very true when you consider the Northern Ireland Assembly and the delicate threads that currently bind it together. I have been asked more questions about the Northern Ireland Troubles than any other subject and people are always confused as to how such nice and genuine people have managed to tear each other apart for many years. The truth is, there is no easy answer, because the history of Ireland is complex. I would recommend at least reading my pages on the brief history of Ireland and the brief history of Northern Ireland before reading about this most complex subject. No-one knows the full details of the Northern Ireland Conflict as much has yet to be discovered but what we do know is that there have been over 3,600 deaths, thousands of people wounded both physically and mentally and the entire population has been left scarred. In the modern era we at least have a lot of documentation, pictures and video to show the horrors that this land has gone through and much has been written about this troubled land. What I hope to do here on this website is two things, to give a brief yet concise history of the troubles and also to share with you my own personal journey, which I will do on a separate page. To try and keep this simple to understand I will take you through each of these and explain how each of the above have their own views and how these views inevitably assured thirty years of death and destruction. The views are of course general views and there are always exceptions but what I am trying to explain is the generic beliefs that ensured conflict. When Northern Ireland formed in 1921, Catholics made up around one third of the population, and it was a state they never accepted, believing that Ireland should be one political island. Catholics are often referred to as nationalists and in some cases republicans. Many believe that Ireland should be a single nation, separate from England or Britain with its own government and many consider Northern Ireland as an illegitimate state. Protestants made up two thirds of the population and are referred to as Unionists as they wanted to be linked closely with Britain. Protestants would consider themselves to be from Ulster and be British and dread the thought of a United Ireland, because they believe that would place under threat their political and religious beliefs. I have placed these together for simplicity as their approach leading up to and perhaps implicit in "The Troubles" was similar, in that they both adopted a hands-off approach during the period of 1921-1968. In essence each was concerned about their individual economic and political developments after the Second World War, and to all intensive purposes left the Northern Ireland government to get on with it. Often let out of any history of the Northern Ireland Conflict is the important Scottish link. I will explain this as we move through this historic look, but going back as far as the Ulster Plantation, this element of Scotland and their wars with England has also strongly influenced the Protestant thought process. So we have two types of people, completely opposed in their views. They differ not only in religion even though both are Christian, but are fundamentally opposed in their political aspirations. We then have two governments who could have helped influence the political landscape, too busy with their home affairs or perhaps unwilling to intervene. That recipe could only mean one thing and that was a guarantee of violence. I don’t believe anyone thought it would result in thirty years of conflict and would result in so many deaths, so much heartache and so much destruction of life, limbs and property. The perfect climate existed caused by entrenched views and a huge political vacuum which would lead to thirty years of Northern Ireland Conflict. I don't believe there is a single point when one can point a figure and say that was the incident, or that was the day it all kicked off. One thing is certain the cocktail of political and civil unrest was perfect for conflict to begin. I also believe that any incident could have kicked it off and the combustible Northern Ireland was simply waiting for a spark to ignite the flame that would explode into action. I will list what happened below and allow you the reader to decide at what stage "The Troubles of Northern Ireland" started. I was eleven years old when the Troubles as they have become known started and I just remember a sense that the country was unease and people around me were generally worried that something was going to happen. Captain Terence O'Neill was Prime Minister of Northern Ireland in 1963. 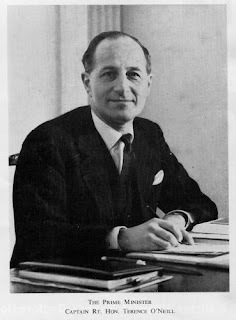 He had taken over from the aging Prime Minister Basil Brooke, who had held the office for almost 20 years. Brooke had faced increasing disenchantment with Unionist party back benchers as he appeared to have at best an indifferent approach to the mounting economic problems. O'Neill was at that time the Finance Minister and a man capable of quicker thinking and a mind for change. The previous Prime Ministers of Northern Ireland had remained unapologetically Protestant and O'Neill adopted a policy of reconciliation between Protestant and Catholic, something that would eventually lead to his downfall as Prime Minister. Terence O'Neill was born in London in 1914 and was educated at Eton College. He served in the Irish Guards during the Second World War. O'Neill had been shot down during the war and had been hidden and sheltered by a Catholic family in the Netherlands, and it was perhaps this that turned his mind to reconciliation. He married in 1944 and had a son called Patrick and a daughter called Anne and they lived in Northern Ireland from 1945 in a converted rectory close to the small village of Ahoghill, near Ballymena in County Antrim. His ministerial style was one of imagination when compared to those who had preceded him. He believed Northern Ireland could change without any threat to the actual union with Britain. He introduced some new investments and began to build relationships with the Trade Unions, and for the first time a Northern Ireland Prime Minister visited a Catholic school. I do think it is important to remember that as this was the early 1960s, the winds of change were blowing throughout the world, communication was easier and education had improved for many people in Northern Ireland. Some say that Captain O'Neill was also a man of a whimsical nature, one of his suggestions being to drain Lough Neagh and as such create a seventh county in Northern Ireland. His focus though was on economical reform and the traditional businesses in Northern Ireland were now in sharp decline. To do this he believed in the creation of wealth by improving the local infrastructure, creating a new town, building a new university and offered generous funding to attract businesses like Michelin, Goodyear and Grundig. O'Neill was in essence following the British Prime Minister Harold Wilson's plan of realising that the staple industries that had served well in the past could not be relied on for economic growth going forwards. An investment of £450 million was provided to attract foreign investment. O'Neill shocked many of his supporters when he invited Sean Lemass , the Irish Prime Minister (Taoiseach) to meet him in Belfast. This was a unique and surprising event as before this no Taoiseach had ever been to the Northern Ireland government building at Stormont situated in East Belfast. This was a risky agreement for both men but in truth the meeting was well thought of both north and south of the border. There were some complaints from some Unionist ministers as the meeting had taken place in secrecy and one young fundamentalist, the Reverend Ian Paisley was a leading voice among them. Paisley was quoted as saying, "A traitor and a bridge are very much alike, for they both go over to the other side". O'Neill carried on however and made two trips to Dublin himself, and sent public condolences to the Roman Catholic primate, Cardinal Conway on the death of Pope John 23rd. I believe the real element of O'Neill that is often not understood is that he was first British and then an Ulsterman, whereas in general terms Ulster protestants were Ulstermen first and British second. These two subtle differences simply meant a different thought pattern and whereas O'Neill was about treating the Republic of Ireland as a separate country and a neighbour, the traditional Ulster Unionist was about avoiding any concept of a United Ireland by being protectionist. This difference is indeed rather subtle but it actually goes a very long way to explaining one of the reasons why Northern Ireland politics is hard to understand. I was eight years old at the time and we saw the news on a black and white valve television, with which we could only receive one channel BBC1. I do distinctly remember my mother saying that she thought he was a nice man, if a bit posh. My mother had been brought up as a traditional catholic so it was unusual to hear such positive things, and perhaps that is why it stuck in my mind. I also remember watching the same old television and seeing the first glimpses of Ian Paisley. He always seemed to be angry and shouted all the time. At my young age I didn't really understand what he was shouting about. Ian Paisley always seemed to be on television back then and I do remember seeing his face quite a lot. His career, now that I have read it is quite extraordinary. He was ordained a minister by his father and became moderator of his own sect, the Free Presbyterian Church. He has always been involved in politics, singing hymns outside buildings, boycotting events, attending marches, made hundreds of demonstrations and been to jail twice. During the O'Neill years he made references to the pope as the anti-Christ and carried out a number of publicity stunts such as trying to remove the Irish tricolour flag from the window of the Republican Headquarters on the Fall's Road in West Belfast. In 1966 he launched a weekly newsheet called the "Protestant Telegraph". He did eventually become the First Minister of Northern Ireland and shared the office with Martin McGuinness of Sinn Fein. When the Education Act was passed in 1944 it had the impact of creating a better educated Catholic middle class. The new graduates coming out of university went mainly into the medical, legal and teaching professions as public sector employment was dominated by Protestants. They founded an organisation called the Campaign for Social Justice (CSJ) as they were frustrated by what was on offer by the Nationalist politicians. It differed in nature as it sought to address what they deemed as injustices against the minority community by influencing British public opinion. They complained about the opening of a second university in Northern Ireland being placed in Coleraine rather than the Nationalist City of Derry, the second biggest city at that time. They also complained that no Catholics were ever admitted to the Conservative and Unionist Party and that little inward investment came to the west of the Province. They also complained about the manipulation of electoral boundaries that made sure Unionists remained in power, even where there was a Nationalist majority. They also raised issues on the unfair allocation of social housing with preference being given to Protestant families. These charges have always been denied and in each case there were a variety of different factors offered as explanation, but the one thing that remained rather naked in its structure was public sector employment. In the lower ranks of public sector working Catholics were fairly represented in terms of employees, however once the higher grades were reviewed this dropped dramatically. For example in 1951 only 12% of more senior posts were filled by Nationalists. There was also an additional element that needs to be considered in that if a Nationalist went to work in the Civil Service, they would have been viewed as suspicious and having gone over to the other side. It was a complex mix for certain and many arguments could be made as to how that situation came about, but the situation was now being highlighted and brought to the attention of a wider audience. The CSJ actions then combined with the Campaign for Democracy in Ulster (CDU) during 1965 and kept the momentum and pressure on the British Government who until then had tried to avoid the Northern Ireland question. The CDU was sponsored by 100 Labour MPs and tried to create a momentum on the basis of social class rather than religion, arguing that Protestant and Catholic working class people had more in common, and religion should not be the key for casting a vote. This was organised by a Northern Ireland MP called Gerry Fitt who had been elected to Westminster and had invited the British MPs to Belfast to see for themselves and help support his cause of equality and socialism. Tension began to rise in Northern Ireland around this time as republicans celebrated the 50th anniversary of the Easter Rising in 1916. Three killings were carried out by a Protestant group styling itself on the Ulster Volunteer Force (UVF). This was not the same UVF that had fought in the world wars or been formed in the early days. This group was at best made up of a few dozen men who met in backstreet locations, mainly from the Shankill Road District and they discussed how to combat a practically defunct IRA. Of the three victims killed, one was a 77 year old Protestant widow who died as a result of a petrol bomb thrown at a Catholic owned bar, the second was a Catholic man who was on his way home along the Fall's Road and the third was a teenage Catholic barman who had gone into a bar in the Shankill Road district and none of them belonged to the IRA. The public were appalled by these incidents and the RUC quickly arrested members of the gang, with some of them receiving lengthy jail sentences. A dangerous mix was brewing with Nationalist pressures being placed on the British Government and the Unionists to start reforms. These pressures when combined with the Easter Rising celebrations, the Battle of the Somme remembrance and the spate of attacks by the UVF were creating a melting pot. The Unionists and sections of the Orange Lodge also began to heckle Terence O'Neill, To add to this new faces were arriving and for the first time John Hume made an appearance, openly crticising Unionism and urging Catholics to participate more in their communities and in the state. Hume was born in Derry and was a school teacher and an active organiser of the Credit Unions. This tied in neatly with the CSJ, the CDU and the influential Gerry Fitt and made a powerful voice for change. These pressures made Harold Wilson the British Prime Minister push Terence O'Neill to make changes and he in turn was being turned against by both his own party and the Unionist majority, warning him that there was to be no watering down of the Northern Ireland state. O’Neil was truly between a rock and a very hard place. Disbanding of the "B Specials"
The voting element was the top of the list and it was a complex issue. There were different voting systems for elections to Stormont and elections to local councils. In local council elections people living at home with their parents or sub-tenants could not vote and therefore about a quarter of the voting population had no vote. In 1968 O'Neill had been Prime Minister for five years and despite his promises of reform little had actually materialised. The Civil Right's Movement brought in a mixture of communists, liberals, students, those on the left wing, trade unionists, middle classes, IRA supporters and members of the Nationalist party. They were joined by John Hume and a psychology student known then as Bernadette Devlin and this unusual gathering then began to use marching as their main activity to create publicity and gain media coverage. Much if not all of this, was taken from the Martin Luther King model and the black civil right's movement in the USA. NICRA did also take some influence from similar types of protest that were happening in Europe and especially in France and in Prague. I remember watching these marches on television and even though I was only ten years old, the one thing I knew then that there was a wind of change about to take place. NICRA had their first publicity, when a young Nationalist MP called Austin Currie protested, by squatting in a house in a small village called Caledon in County Tyrone. The house in which he squatted had been allocated to a 19-year old Protestant girl who was not married. She was the secretary of a councilor's solicitor who was also a Unionist parliamentary candidate. She was given the house in preference to two Catholic families who had complained about the unfair allocation of housing at previous times. Austin Currie had raised the matter with the local council and at Stormont but without any success. As a means of protest he occupied the girl's house for some hours before being evicted by the Royal Ulster Constabulary (RUC). An interesting fact was that one of the policemen who evicted Currie was actually the girl's brother, who moved into that exact house at a later date. This brought a lot of publicity for NICRA and for Currie, and he held a rally a few days later which was attended by thousands of people. Again I remember watching this incident unfold on television and even though I was not of an age to understand it, I do remember the general reaction being one of anger with the RUC. There was also a strange reaction from some who believed that people like Austin Currie should know their place and stop agitating as it would only cause trouble. In August 1968 NICRA staged the first protest march and it was to take place from the village of Coalisland to the town of Dungannon. This protest march would be opposed by Ian Paisley and his Ulster Protestant Volunteers and over the coming years, this would be a pattern that would become familiar to the people of Northern Ireland. This march passed without trouble but the next one planned for Londonderry City was to kick off the violence so often recognised on the television for years to come. A left wing group organised the march as a provocative means of pushing the Northern Ireland government into action and they certainly achieved that objective. William Craig who was Minister of Home Affairs for the O'Neill government banned the march, and the only impact that had was to swell the number of people who were going to attend. The planned but banned march went ahead and the RUC reacted by using water cannons and batons on what were viewed as peaceful protesters. This was captured on television cameras and broadcast for weeks throughout the world. Hospitals recorded treating 27 civilian casualties who had sustained bruises and blows to the head. One person injured at this march was Gerry Fitt who had been there with 3 British Labour Party MPs. The pictures of Gerry Fitt in a white shirt with his bloodied head were shown throughout the world and in most cases were met with outrage and served huge damage on the Unionist Government under Terence O'Neill. Like most ten year olds I was fascinated watching all of this unfold on television. I had no idea that this was all happening about 60 miles from where I lived. I have one very clear memory of an RUC man with a baton charging and whacking a man over the head many times. The snapshot of this filled the television screens and has become quite an iconic view from the early days of The Troubles. In the small village where I lived we only had one RUC police man and my only thought was to avoid him at all costs. This wasn’t because he was an RUC policeman; this was because we didn’t want him telling our parents we had done anything bad like raiding an orchard. So yes some type of normal life did go on around many towns and villages in Northern Ireland. The behaviour of the RUC, under instruction from the Unionist government, caused real anger within the Catholic and Nationalist population. Their actions in dealing with the demonstrators fulfilled only one thing and that was to ensure a strong nationalist support for the marchers. With this support, many more marches and various types of protest took place which eventually caused Harold Wilson the British Prime Minister to summons Terence O'Neill to Westminster for a meeting. Wilson wanted action taken and yet as I have said O'Neill was caught between a rock and a very hard place. On one side he had Wilson pushing for reform, while within in his own party and the wider Unionist community, they were opposing any form of appeasing the Nationalist grievances. In particular William Craig opposed any reforms and although they agreed to some minor changes, they would not consider changing the main grievance, that of "one man one vote." The main reason for the reluctance to change was the Unionist view that the Civil Right's marchers had been infiltrated by the IRA, their sole purpose being to undermine the state of Northern Ireland. As the disagreement continued O'Neill sacked William Craig after he challenged his authority, but for O'Neill the end was inevitable. On the 4th January 1969, trouble flared when a march organised by the People's Democracy was confronted by groups of loyalists at Burntollet Bridge in Londonderry. This was also captured on television screens and shown throughout the world, where men and women who had been marching were pelted with bricks and stones and then attacked by men carrying cudgels. The police (RUC) were accused of standing back and allowing this to happen and indeed it was also alleged that many of those who attacked the march were in fact members of the "B-Specials". During January Ian Paisley was in prison after an event he took place in at Armagh. O'Neill, faced with such consistent and heavy pressure called a general election, which caused internal unionist division and saw young civil right's leaders elected for the first time. After this bombing of electricity and water utilities took place which were initially blamed on the IRA, but which later were known to have been conducted by the UVF to try and bring down the O'Neill government. A further by-election saw the arrival of a radical character to Northern Irish politics in the form of Bernadette Devlin. Before O'Neill was eventually forced from government he did manage to get through the "one man one vote" reform. He will probably be best remembered as a man who was essentially English, was a reformer who got squeezed out of power by an unrelenting pressure from two opposing political views. He was replaced by James Chichester-Clark, a farmer from County Londonderry. He served for two years but in truth was not a man who took easy to leadership, and he never did come to terms with the three varying elements of unionism, nationalism and London. He was Prime Minister during what became known as the "Battle of the Bogside ". This occurred when an Apprentice Boy's March was allowed to go ahead and nationalists from the nearby nationalist Bogside estate protested against that. It escalated quickly with stone throwing, petrol bombs and the RUC responding with tear gas. The pitched battle lasted for days as the residents tried to prevent the RUC entering the Bogside area. This rioting then started to spread to Belfast and the RUC began to become stretched to the absolute limit. In Belfast old guns and rifles were recovered and shots rang out throughout the city. The constant baton charges of the RUC and the retorts by brick throwing nationalists went on for days. Four people were killed by the RUC and four more also died, and Clark was forced to ask for help from London.This was the arrival of the British troops into Northern Ireland. At that time, many believed they would only be there for a very short period of time. James Callaghan the British Home Secretary granted permission for the troops to go in and they were welcomed with open arms by the Catholic population, glad of the respite after weeks of rioting. I also remember a sense of relief when the troops arrived. I was eleven years old now and was beginning to understand what was going on. Our family had also moved from the quiet village of Ballycastle near the Giant’s Causeway to the town of Antrim. Antrim was located only 16 miles from Belfast and I was now going to school in Belfast so suddenly for me it was all starting to get very real. I remember seeing these troops for the first time and also seeing the large army lorries with soldiers inside them all carrying guns. As an eleven year old this was also a very exciting time as we watched them with a sense of both curiousity and a large dose of mystery. The rioting stopped and the damage was counted and the Northern Ireland landscape scarred forever. Street barricades which had dominated the areas were replaced with barbed wire army ones. Many homes and buildings had been destroyed and more importantly the old sectarian wounds had been once again laid wide open. The Bogside remained a no-go area to the RUC for another three years. Harold Wilson and Jim Callaghan, with their troops in place then started to take a more hands on approach to Northern Ireland and ended the B-Specials and instructed Sir Arthur Young to head up the RUC and introduce reforms. This was now met with rioting from the Unionists and the first RUC man, a Victor Arbuckle was shot dead by loyalists who were protesting in the defence of the RUC to remain as they were. At this time the Republic of Ireland government were being requested for help from many nationalists in the North. Jack Lynch was the Taoiseach at this time and he made a speech saying that "his government could not stand by and see innocent people injured and perhaps worse". It was at best a token support for the Northern nationalists but in reality it was a measure more intent in ensuring that the Republic of Ireland did not become involved in the violence of the North, and the raising once again of a partitioned country. Rumours circulated that around this time Irish soldiers were coming to the North to protect nationalist areas, but this was never any more than a consideration. Lynch did train men from Londonderry in the use of arms and allocated money to the relief of stress, some of which "vanished". This was a time when the actual reality of a United Ireland was under some serious consideration, but the reaction from the Republic of Ireland government was one of worry, realising they would inherit the problems of the North of Ireland. During this early period of violence many Catholics were displaced from their homes. Some Protestants were also burned out and displaced but Catholics represented about 80 percent of those who had been forced to flee their homes. The IRA who many Catholics viewed as defenders received a great deal of criticism as to how ineffective they were and the initials IRA were dubbed upon a wall as "I Ran Away". At this time the IRA had its leadership in the Republic of Ireland and was essentially a left wing party who based its policies on a bringing together of a working class structure for Protestants and Catholics alike. Despite the violence now happening in the North of Ireland, they attempted to maintain this approach and mean time in Belfast a more hard line approach was being asked for. It is fair to say that the majority of Catholics would not be strong supporters of the IRA, however in times of high tension or when under attack, the people living in those nationalist areas would turn to the IRA for help. This was the case in 1969 and inevitably a split occurred between the old Marxist based IRA and a new younger more traditional republican approach. The old guard became known as the Official IRA and the new guard became known as the Provisional IRA (PIRA) taking their name from the Irish Proclamation which had referred to a Provisional Government. It was not a pleasant split but the newly formed Provisional movement described their role as defence and retaliation. Two protestants were then killed, one from Londonderry being kicked to death. A UVF man carrying a bomb also blew himself up when on a mission in the Republic of Ireland. In very simple terms the arrival of the British Troops had eased the ugly violence and helped restore some type of uneasy peace, both both nationalist and unionist paramilitary groups were preparing for a full confrontation. It was a time of enormous and deadly tension. Going to school in Belfast was a very strange experience for me. We had to take a bus from where I lived in Antrim to the school I attended which was close to Carlisle Circus roundabout in North Belfast. This bus was regularly pelted with stones and yet once inside the school, any danger that was happening outside seemed to disappear within the walls of the school.